Regardless of the insurance plan you choose, you’ll likely find that nearly all of them cover the cost of preventive care. Insurance companies see preventive care as the number one defense against dental disease, and they aren’t wrong! When you take the time to visit at least twice a year for exams and cleanings, typically every six months, you’re able to catch disease and treat them accordingly. While these visits are mainly intended to catch problems early, remove plaque and treat gum disease, they’re also a way to confirm that you’re keeping your at-home oral care in check. It’s just another chance to make adjustments to your routine should the dentist notice that tartar is present or your gum tissue’s pocket depth is deeper than it should be. By scheduling an appointment now, you can get the cost of your preventive care covered 100 percent, assuming you’ve met your deductible. To confirm your coverage, the first step is making sure the dentist you visit is an in-network provider. In-network doctors have agreed to contracts with insurance companies, therefore offering patients savings under that plan. While some out-of-network dentists may offer similar discounts, they aren’t contractually obligated to certain rates if they don’t take your insurance, so keep this in mind. When choosing dental care, preventive treatments like checkups, cleanings, X-rays and even fluoride treatments and dental sealants are 100 percent covered. However, coverage for fluoride and sealants can vary depending on age. 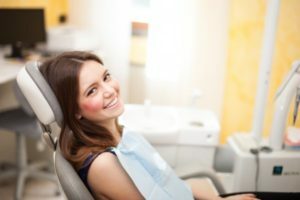 In contrast, basic dental care includes fillings, root canals, extractions and periodontal therapy and is typically covered up to 80 percent. Advanced dental treatments like crowns, bridges, inlays/onlays and dentures are usually covered up to 50 percent. Can you provide a verification of benefits? – This document helps you understand what treatments you’re eligible for under your insurance plan. What is my annual maximum? – This is the total annual amount your insurance plan will cover you after you’ve met your deductible. This amount is usually between $1,000 and $1,500. What alternative payment plans do you offer? – If your insurance doesn’t cover the entire cost of your treatment, there are other methods in which you can pay for services. Ready to keep you and your family’s oral health protected? Schedule an appointment today to get started! Dr. Andrew Luccio earned his Doctor of Dental Medicine degree from the Tufts University School of Dental Medicine. His practice offers Blue Cross, Delta Dental and Cigna insurance plans to help people get the treatment they need. If you have more questions about maximizing your benefits, you can contact him through his website.